DLL1 and DLL4 are Notch ligands with high structural similarity but context-dependent functional differences. Here, we analyze their functional divergence using cellular co-culture assays, biochemical studies, and in vivo experiments. DLL1 and DLL4 activate NOTCH1 and NOTCH2 differently in cell-based assays and this discriminating potential lies in the region between the N-terminus and EGF repeat three. Mice expressing chimeric ligands indicate that the ectodomains dictate ligand function during somitogenesis, and that during myogenesis even regions C-terminal to EGF3 are interchangeable. Substitution of NOTCH1-interface residues in the MNNL and DSL domains of DLL1 with the corresponding amino acids of DLL4, however, does not disrupt DLL1 function in vivo. Collectively, our data show that DLL4 preferentially activates NOTCH1 over NOTCH2, whereas DLL1 is equally effective in activating NOTCH1 and NOTCH2, establishing that the ectodomains dictate selective ligand function in vivo, and that features outside the known binding interface contribute to their differences. A small number of signaling systems control how an animal develops from a single cell into a complex organism made up of many different cell types. Signals pass back and forth between cells, switching genes on and off to direct the development of tissues and organs. One of these signaling systems, called Notch, is so ancient that it appears in nearly all multicellular organisms. A cell sends a Notch signal using proteins called Delta or Jagged ligands that span membrane of the cell, so that part of the protein sits inside the cell and part remains outside. To change the behavior of another cell, the ligands bind to proteins called Notch receptors that span the membrane of the receiving cell. Mammals have two types of Delta ligand, two types of Jagged ligand and four types of Notch receptor. Cells in different tissues display different combinations of these eight proteins. Two Delta ligands called DLL1 and DLL4 often appear together in developing organisms. Some tissues need both and some only the one or the other. In some cases one ligand can compensate if the other is missing, but in others not. It was not clear why this is, or which parts of the proteins are responsible. Tveriakhina et al. used mouse cells to investigate how DLL1 and DLL4 interact with two Notch receptors, called NOTCH1 and NOTCH2. 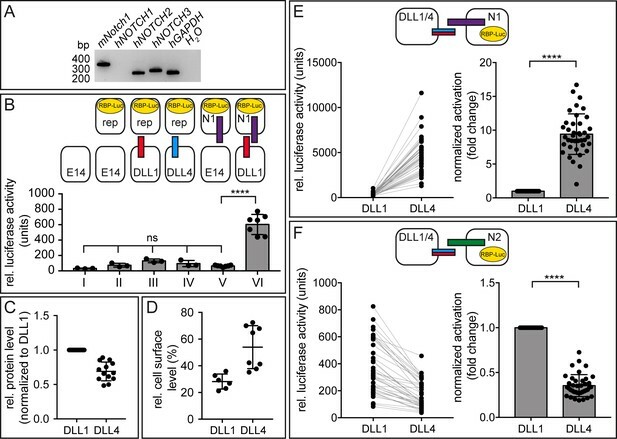 The results of these experiments show that while DLL1 can bind and activate both Notch receptors equally, DLL4 prefers to partner with NOTCH1. To find out which parts of the ligands are responsible for this selectivity, Tveriakhina et al. created hybrid ligands that contained a mixture of regions from DLL1 and DLL4. These suggest that the different binding preferences depend on parts of the ligands that sit outside cells and that lie outside the known sites of binding contact with the Notch receptors. Further experiments studied mice that had been engineered to produce hybrid ligands as replacements for DLL1. A hybrid ligand consisting of the part of DLL1 that sits outside cells and the part of DLL4 found inside cells generated Notch signals in the tissue that depended on the activity of DLL1. However, a hybrid consisting of the part of DLL4 that sits outside cells and the part of DLL1 found inside cells did not, showing that in developing mice the parts that sit outside the cells contribute to the different functions of DLL1 and DLL4. Overall, the results presented by Tveriakhina et al. show that interactions between specific ligands and receptors play important roles in how mammals develop. Further efforts to understand which parts of the ligands affect selectivity could ultimately allow researchers to develop ways to modify how ligands and receptors interact. Such “molecular engineering” strategies could enable cell responses to be precisely controlled by pairing designer ligand-receptor pairs to develop cell-based therapies. The Notch signaling pathway mediates communication between neighboring cells in metazoans and thereby regulates a multitude of developmental processes in various tissues (Artavanis-Tsakonas et al., 1995; Yoon and Gaiano, 2005; Bolós et al., 2007; Gridley, 2007; Radtke et al., 2010; Koch and Radtke, 2011; reviewed in Louvi and Artavanis-Tsakonas, 2012; Kopan, 2012). This communication depends on the interaction of Notch receptors on the surface of the signal receiving cells with transmembrane ligands on the surface of adjacent cells. Ligand binding then leads to a sequence of proteolytic cleavages of the receptor releasing the Notch intracellular domain (NICD) from the membrane. NICD translocates into the nucleus where it enters into a complex with a CSL protein (CBF-1/RBPJ in mammals, Suppressor of Hairless in flies, and Lag-1 in worms) and a protein of the Mastermind family (Petcherski and Kimble, 2000; Wu et al., 2000; Nam et al., 2003; Nam et al., 2006; Wilson and Kovall, 2006; Choi et al., 2012) to regulate transcription of target genes (reviewed in Bray, 2016). Mammals have four Notch receptors (N1-N4) and four activating ligands of the DSL (Delta, Serrate, LAG-2) family: DLL1 and DLL4, orthologs of Drosophila Delta, and JAG1 and JAG2, orthologs of Drosophila Serrate. DLL1 and DLL4 are similar in domain structure, size and sequence (Shutter et al., 2000). Both proteins contain an N-terminal MNNL (also referred to as C2) domain (Chillakuri et al., 2013; Suckling et al., 2017), followed by a DSL domain and eight EGF-like repeats in their extracellular portion, and a less well conserved intracellular domain. The MNNL and DSL domains, required for high-affinity binding of Delta-like ligands to Notch receptors (Rebay et al., 1991; Cordle et al., 2008), contact EGF repeats 12 and 11 of Notch, respectively (Luca et al., 2015). Contributions from adjacent EGF-like repeats, however, are required for signal transduction by Delta-like ligands (Andrawes et al., 2013) as well as for optimal interaction with Serrate (Yamamoto et al., 2012) and Jagged (JAG)-family ligands (Luca et al., 2017). Although the biological activities of DLL1 and DLL4 are partially overlapping, the two proteins are not equivalent in vitro or in vivo. In cell culture studies, DLL4 is more effective than DLL1 in activating N1 signaling during T cell development (Besseyrias et al., 2007), consistent with its ten-fold higher binding affinity in binding studies using purified fragments of N1, DLL1, and DLL4 (Andrawes et al., 2013). In vivo, studies of adult intestinal epithelium in mice have shown that DLL1 and DLL4 are co-expressed in crypts and act redundantly to maintain the intestinal stem cell pool (Pellegrinet et al., 2011). In contrast, however, mouse DLL1 cannot fully replace DLL4 in its ability to trigger T lineage commitment (Besseyrias et al., 2007; Mohtashami et al., 2010). Conversely, endogenous DLL4 does not substitute for DLL1 in its ability to promote development of the arterial vascular epithelium (Sörensen et al., 2009), nor does it compensate for the function of DLL1 in the paraxial mesoderm, a tissue where these ligands are normally not co-expressed: mice in which DLL1 was replaced by DLL4 had severe somite patterning defects and showed premature myogenic differentiation leading to reduced skeletal muscles. However, the function of DLL1 during early retina development was rescued by DLL4 in these mice (Preuße et al., 2015). Collectively these studies indicate that the functionality of DLL1 and DLL4 strongly depends on context, but it remains unclear which portions of these similar DSL proteins account for their functional non-equivalence. A recent study in cell culture observed that DLL1 and DLL4 stimulate NOTCH1 receptors to produce responses with different dynamics, attributing differences between pulsatile signaling of DLL1 and sustained signaling by DLL4 to the intracellular, rather than the extracellular, regions of the proteins (Nandagopal et al., 2018). Here, we investigate the influence of the extracellular and intracellular regions of DLL1 and DLL4 chimeric proteins on ligand function in cell culture assays, and for selected chimeras, in biochemical binding assays and in vivo in mice. We observe that in vivo differences of DLL1 and DLL4 function during somite patterning and myogenesis are encoded by the ligands ectodomains, that DLL1 and DLL4 are able to discriminate between NOTCH1 and NOTCH2 in vitro, and that ligand residues outside of the known binding interface are important contributing factors for ligand function in vivo. Previous in vivo analyses indicated that DLL4 cannot substitute for DLL1 function during embryonic development (Preuße et al., 2015). To test whether the inability of DLL4 to rescue the loss of DLL1 in the paraxial mesoderm in vivo resides in its extra- or intracellular domain we generated single copy transgenic mice allowing for the conditional expression of chimeric DLL molecules consisting of the extracellular domain of one ligand and transmembrane and intracellular domain of the other (D1ECD_D4ICD and D4ECD_D1ICD, II and VII in Figure 1). Transgenes were introduced into the Hprt locus of Hprt-deficient E14TG2a ES cells by homologous recombination using the strategy already employed for the initial analysis of full length DLL1 and DLL4 during somitogenesis (Preuße et al., 2015). Briefly, cDNAs encoding chimeric ligands were cloned into the targeting vector pMP8 in reverse orientation downstream of neomycin phosphotransferase (neor) driven by the CAG promoter. Cre-mediated recombination of two loxP sites and two mutant loxP2272 (loxM) sites removes the neor cassette and flips the gene of interest and results in its expression from the CAG promoter (Figure 2A). Schematic representation of DLL1 and DLL4 and variant proteins. I-X, full-length and chimeric ligands generated by domain swaps. XI and XII, ligands with exchanges of the known NOTCH1 contact amino acids in the MNNL and DSL domains. XIII, DLL4 variant with an N109G mutation that eliminates the N-glycosylation site in DLL4. XIV-XVIII, soluble proteins encoding the N-terminal region up to and including EGF5 carrying a C-terminal Avi-His-tag for protein purification. I-XIII were tested in cell-based Notch activation assays, II, III, VII and XI in transgenic mice, XIV-XVIII used for measurements of binding affinities to N1. Proteins analyzed in cell-based assays were C-terminally Flag-tagged, proteins analyzed in mice were untagged. Break points and surrounding amino acid sequences and point substitutions are illustrated in Figure 1—figure supplement 1. Red domains/spikes: DLL1; blue domains/spikes: DLL4; white asterisks: N109G mutation. ECD, extracellular domain; N, N-terminus; D, DSL domain; E, EGF repeat, TM, transmembrane domain; ICD, intracellular domain; D, DLL; cont, N1 contact amino acids. The extracellular domains of DLL1 and DLL4 determine ligand behavior during somitogenesis. (A) Scheme of the targeting vector pMP8.CAG-Stop used to introduce inducible chimeric ligands into the Hprt locus, and of Cre-mediated activation of transgene (D1ECD_D4ICD or D4ECD_D1ICD) expression driven by the CAG promotor (CAG prom). 5’ hom and 3’ hom, Hprt 5’ and 3’ homology regions; ex1-3 (grey boxes), Hprt exons; neor, neomycin phosphotransferase; pA, polyadenylation signal; hHPRT prom, human Hprt promoter; DLL1/4iresdsRED, chimeric ORF–linked to dsRed tag by an internal ribosomal entry site (IRES). (B) Uncx expression in E9.5 wild type embryos (a, a’; n = 28), embryos lacking DLL1 in the mesoderm (b, b’; n = 12) and male embryos lacking DLL1 in the mesoderm that express either D1ECD_D4ICD (c, c’; n = 9) or D4ECD_D1ICD (d, d’; n = 8) showing that the extracellular domain of DLL1 but not of DLL4 can restore Uncx expression. (C) Whole mount immunofluorescent staining of wild type (a–c) and D4ECD_D1ICD/Y;T(s):Cre (d–f) PSMs using antibodies recognizing the extracellular domain of DLL4 showing co-localization of the exogenous chimeric ligand with pan-Cadherin (panCad) at the cell surface. Additional intracellular staining most likely reflects the presence of the ligand in the ER and trans Golgi as observed previously for DLL1 in cultured cells (Geffers et al., 2007; Müller et al., 2014) and for endogenous DLL1 and transgenic DLL4 in the PSM (Preuße et al., 2015). n = 3 for wild type, n = 4 for D4ECD_D1ICD/Y;T(s):Cre; Scale bar = 10 µm. To test whether the extracellular or intracellular domain determines the inability of DLL4 to rescue the loss of DLL1 in mesodermal tissues of early embryos, we induced expression of either chimeric ligand and simultaneously removed endogenous DLL1 using a floxed Dll1 allele and a Cre transgene expressed in the primitive streak driven by a promoter derived from brachyury (T(s):Cre) (Feller et al., 2008). Because the Hprt locus is located on the X-chromosome, we used hemizygous male embryos for the analysis. As previously described, inactivation of Dll1 in the mesoderm resulted in loss of Uncx (formerly called Uncx4.1) expression in caudal somite compartments (n = 12; Figure 2Bb,b') indicating severe somite patterning defects compared to wild type embryos (n = 28; Figure 2Ba,a'). Expression of D1ECD_D4ICD in Dll1-deficient embryos (n = 9) restored robust expression of Uncx similar to full length DLL1 (Preuße et al., 2015). Uncx expression expanded into cranial somite compartments (Figure 2Bc,c') reminiscent of ectopic Notch activity (Feller et al., 2008), probably reflecting non-restricted D1ECD_D4ICD expression throughout the PSM and somites. In contrast, expression of D4ECD_D1ICD barely restored Uncx expression in the majority (n = 8/12) of Dll1-deficient embryos (Figure 2Bd,d'), a phenotype similar to that seen with full-length DLL4 (Preuße et al., 2015), even though the chimeric ligand was expressed and detected on the cell surface of PSM cells (Figure 2Cd-f). As observed previously for full-length DLL4 (Preuße et al., 2015) some embryos (n = 4) displayed essentially normal Uncx expression (not shown), which might result from some perdurance of DLL1 activity or delayed or inefficient excision of endogenous Dll1. 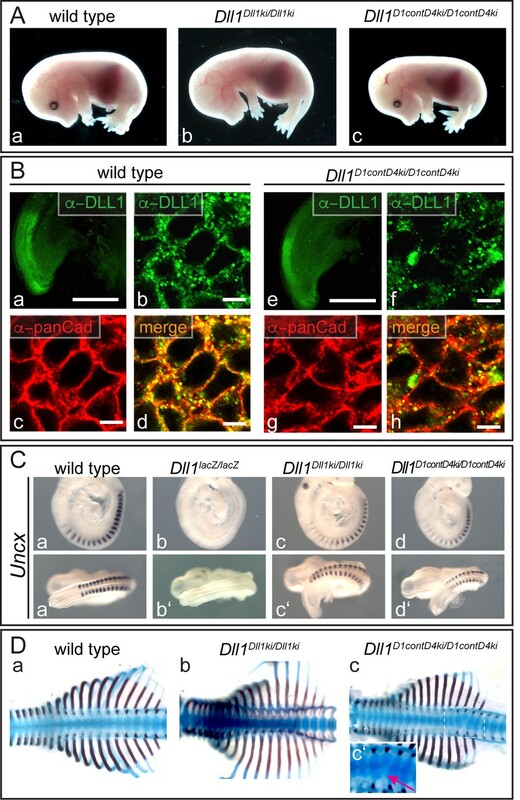 Overall, this analysis strongly suggests that the functional difference between DLL1 and DLL4 observed in vivo during somitogenesis resides in the extracellular domains. The N-terminal MNNL and DSL domains and adjacent EGF repeats 1–3 constitute the major interface for interaction between DSL ligands and Notch receptors, and are essential for (full) activation of Notch signaling (Cordle et al., 2008; Andrawes et al., 2013; Luca et al., 2015; Schuster-Gossler et al., 2016; Luca et al., 2017). To analyze whether this region accounts for the observed differences between DLL1 and DLL4 in vivo we generated a chimeric ligand that contained the N-terminal region up to and including EGF3 of DLL1 fused to EGF4 and the remaining C-terminal portion of DLL4 (D1N-E3_D4, III in Figure 1; the amino acid sequence around the fusion is shown in Figure 1—figure supplement 1Ab). We then tested whether this chimeric ligand is sufficient for normal DLL1 function during development. We generated mice (Dll1D1N-E3_D4ki) expressing D1N-E3_D4 instead of DLL1 using the "mini-gene“ knock-in strategy (Figure 3A) that disrupts endogenous Dll1, successfully employed previously to express either a Dll4 or Dll1 (control) mini-gene (Schuster-Gossler et al., 2007; Preuße et al., 2015; Schuster-Gossler et al., 2016). Heterozygous mice obtained from two independent targeting events carrying the Dll1D1N-E3_D4ki allele were viable and showed no apparent phenotype. Homozygous Dll1D1N-E3_D4ki mice were stillborn (n = 3 and 4, respectively), indicating that D1N-E3_D4 cannot fully replace DLL1 during development although it is present on the cell surface of PSM cells (Figure 3Cd-f). At E15.5 homozygous Dll1D1N-E3_D4ki fetuses showed a stumpy tail (n = 5 and 6, respectively; arrow in Figure 3Bb) similar to Dll1Dll4ki mutants (Figure 3Bd); however, they lacked the edema observed in Dll1Dll4ki homozygotes (arrowhead in Figure 3Bd). D1N-E3_D4 was also not able to restore normal Uncx expression (Figure 3De). Axial skeletons of homozygous Dll1D1N-E3_D4ki fetuses were severely disorganized (n = 10; Figure 3Ef), a phenotype consistent with abnormal Uncx expression and similar to Dll1Dll4ki/Dll4ki homozygote axial skeletons (Figure 3Ed), although the rib cage appeared less compressed. In contrast to Dll1Dll4ki heterozygotes (Figure 3Ec; Preuße et al., 2015), which often displayed axial skeleton defects (n = 14/16) such as hemivertebrae (arrow in Figure 3Ec) and fused ribs (arrowheads in Figure 3Ec) heterozygous Dll1D1N-E3_D4ki fetuses showed no defects of the axial skeleton (n = 0/14; Figure 3Ee) indicating that D1N-E3_D4 lacks the dominant interfering activity of DLL4. D1N-E3_D4 is not able to compensate for DLL1 function during somitogenesis. (A) "Mini-gene“ targeting strategy to express DLL1 or DLL4 variants from the Dll1 locus (a) and alleles generated in this study (d and e). The Dll1Dll1ki (b) and Dll1Dll4ki (c) control alleles were described previously (Preuße et al., 2015; Schuster-Gossler et al., 2016). Dll1D1N-E3_D4ki (d) encodes a fusion protein between the N-terminal part of DLL1 including EGF3 fused to EGF4 and the remaining C-terminal portion of DLL4 (III in Figure 1 and Figure 1—figure supplement 1Ab). Dll1D1contD4ki (e) encodes a DLL1 variant whose predicted amino acids of the MNNL and DSL domains that contact N1 are replaced by the corresponding amino acids of DLL4 (XI in Figure 1, Figure 5C, and Figure 1—figure supplement 1B). All alleles have an identical structure and intron 9 and 10 sequences of Dll1. (B) External phenotypes of wild type (a; n = 19), homozygous Dll1D1N-E3_D4ki (b; n = 11), Dll1Dll1ki (c; n = 3) and Dll1Dll4ki (d; n = 3) control E15.5 fetuses. Arrow in (b) points to the short tail. Arrowhead in (c) points to edemas present in homozygous Dll1Dll4ki fetuses. (C) Indirect immunofluorescence staining of wild type (a–c, j–l), homozygous Dll1D1N-E3_D4ki (d–f, m–o), and homozygous Dll1Dll4ki (g–i, p–r) E9.5 PSMs using antibodies recognizing the extracellular domain of DLL4 (a, d, g) and DLL1 (j, m, p) and pan-Cadherin (panCad; b, e, h, k, n, q) showing expression of D1N-E3_D4 and co-localization with the cell surface marker pan-Cadherin. Staining of D1N-E3_D4 appears weaker than DLL4 most likely because much of the epitope recognized by the polyclonal anti-DLL4 antibody is missing in this chimeric protein. n ≥ 3; Scale bar = 5 µm. (D) WISH of E9.5 embryos showing that D1N-E3_D4 does not restore normal Uncx expression (e; n = 10) resembling the Dll1Dll4ki phenotype (d; n = 7). (E) Skeletal preparations of wild type (a; n = 11), homozygous Dll1Dll1ki (b; n = 6), heterozygous (c; n = 14/16) and homozygous (d; n = 3) Dll1Dll4ki, and heterozygous (e; n = 14) and homozygous (f; n = 10) Dll1D1N-E3_D4ki E15.5 fetuses. Arrow and arrowheads in (c) point to axial skeleton defects that were not detected in Dll1D1N-E3_D4ki heterozygotes (e). (F) Cross-sections of hind limbs of wild type (a), homozygous Dll1Dll1ki (b), homozygous Dll1Dll4ki (c), and homozygous (d-f; n = 3) Dll1D1N-E3_D4ki E18.5 fetuses stained for expression of Myosin Heavy Chain (MHC) indicating that D1N-E3_D4 rescues the skeletal muscle phenotype in contrast to DLL4. Arrows in (c) point to skeletal muscle remnants. Deletion of DLL1 during myogenesis leads to premature differentiation of myogenic progenitor cells resulting in severe skeletal muscle hypotrophy at fetal stages (Schuster-Gossler et al., 2007). This phenotype cannot be suppressed by DLL4 expression (Figure 3Fc; Preuße et al., 2015). In contrast, skeletal muscles of Dll1D1N-E3_D4ki/D1N-E3_D4ki homozygotes (Figure 3Fd-f; n = 3) were virtually indistinguishable from Dll1Dll1ki/Dll1ki (Figure 3Fb) and wild type fetuses (Figure 3Fa). These in vivo analyses indicate that, unlike the D1ECD_D4ICD chimera, D1N-E3_D4 is not a fully functional DLL1 ligand during somite patterning. However, D1N-E3_D4 remains functional during myogenesis and restricts muscle progenitor differentiation despite the presence of the DLL4 ICD, consistent with the conclusion that in vivo the functional difference between DLL1 and DLL4 is encoded in the ECDs. In cell-based trans-activation assays using HeLa cells stably expressing murine N1 (HeLaN1) co-cultured with CHO cells expressing mouse DLL1 (mDLL1) or DLL4 from the same locus both ligands activated a transiently expressed Notch reporter similarly (Preuße et al., 2015). However, a purified fragment of the extracellular domain of human DLL4 (N-terminus up to and including EGF5: hD4N-E5) bound to hN1 with an approximately ten-fold higher affinity than the corresponding hDLL1 fragment (Andrawes et al., 2013). Like hD4N-E5, mD4N-E5 has a higher affinity for hN1 (KD = 0.43 ± 0.046 µM; Figure 1—figure supplement 2Aa) than the corresponding mDLL1 fragment (KD = 1.56 ± 0.207 µM; Figure 1—figure supplement 2Ab), as judged by biolayer interferometry measurements. To find a potential explanation for the discrepancy between binding affinities and Notch activation in HeLaN1 cells we analyzed these cells for expression of other Notch receptors and found that in addition to exogenous mouse Notch1 HeLaN1 cells express endogenous NOTCH2 and NOTCH3 (Figure 4A), which might have masked underlying differences in the intrinsic N1 response to the DLL1 and DLL4 ligands. DLL1 and DLL4 differentially activate NOTCH1 and NOTCH2 in cell-based co-culture assays. (A) RT-PCR analysis using RNA of HeLaN1 cells shows the expression of endogenous human NOTCH2 and NOTCH3 in addition to the exogenous murine Notch1. (B) ES cell-based trans-activation assays demonstrate that E14TG2a ES cells express negligible amounts of endogenous Notch receptors and ligands. Co-cultivation of ES cells with stable expression of either DLL1 (III) or DLL4 (IV) from the Hprt-locus with ES-cells carrying only the RBP-Luc reporter in the Hprt-locus (E14rep) showed luciferase activity at levels indistinguishable from lysates of only E14 cells (I) and co-cultures of wild type E14 and reporter carrying ES cells (II). Similarly, co-culture of ES cells carrying N1 and the RBP-Luc reporter (N1rep) with E14 cells (V) did not show reporter activation significantly above background levels, whereas co-culture of DLL1 expressing cells with N1rep ES cells showed a 6–10-fold increase in luciferase activity (VI). n ≥ 3 co-cultures with 2–4 replicate measurements per n (Figure 4—source data 1). Mean ± SD, ns = p ≥ 0.05, ****=p < 0.0001, one-way ANOVA followed by Tukey’s multiple comparison test. (C) Protein expression analysis indicating similar expression levels of DLL1 and DLL4 in the ES cell clones used. Each DLL4 value represents a technical replicate, which was referenced to its paired DLL1 value, which was arbitrarily set to one for each measurement. The non-normalized values (DLL/β-Tub ratios) are depicted in a graph in Figure 4—figure supplement 1A (Figure 4—source data 2). (D) Cell-surface biotinylation demonstrating that a slightly higher fraction of DLL4 is present at the cell surface compared to DLL1 (n ≥ 6; Figure 4—source data 3). (E) DLL4 activates N1 about 10-fold more strongly than DLL1 in co-culture assays. Left graph shows non-normalized N1 activation. Lines connect values measured in the same assay. Right graph shows values normalized to DLL1 activation, and corrected for protein expression and cell surface presentation. (F) DLL4 activates N2 about half as strongly as does DLL1. Left graph shows non-normalized N2 activation. Lines connect values measured in the same assay. Right graph shows values normalized to DLL1 activation, and corrected for protein expression and cell surface presentation. Each dot represents a technical replicate. Raw data are shown in Figure 4—source data 4 and Figure 4—source data 5. Co-cultures (n = 39) with two replicate measurements per n. Mean ± SD, ns = p ≥ 0.05, ****=p < 0.0001, Student’s paired t-test. To detect potential differences in ligand activity towards N1 or N2, the two Notch receptors present during somitogenesis, and to reduce variability due to transient reporter expression we stably integrated a Notch luciferase reporter in the Hprt locus (E14rep) of mouse E14TG2a ES (E14) cells, and generated stable cell lines expressing either Notch1 (N1rep) or Notch2 (N2rep) in these cells (Schuster-Gossler et al., 2016). When co-cultured with E14 cells or DLL1 or DLL4 expressing cells, E14rep cells show luciferase activity similar to wild type E14 levels (compare I to II, III, and IV in Figure 4B; numerical values in Figure 4—source data 1), indicating that negligible amounts of functional endogenous NOTCH receptors are present in E14 cells. Likewise, N1rep cells show essentially no activation above background when co-cultured with wild type E14 ES cells (compare V to I in Figure 4B; numerical values in Figure 4—source data 1), indicating insignificant amounts of functional endogenous Notch ligands in these cells. ES cells expressing exogenous DLL1 activate the luciferase reporter approximately ten-fold above the basal signal in E14 ES cells when co-cultured with N1rep cells (compare VI to V in Figure 4B; numerical values in Figure 4—source data 1) indicating that our co-culture system reliably measures specific Notch signaling activity. To create ligand presenting cells for a comparison between mDLL1 and mDLL4, we generated ES cells expressing either mDLL1 or mDLL4 from single copy integrations into the Hprt locus. Co-cultures (n = 39) of cells expressing DLL1 or DLL4 with N1rep ES cells consistently revealed higher activation of N1 by DLL4 than by DLL1 (mean 12.454 ± 3.961 SD fold of non-normalized luciferase activity, 9.42 ± 2.997 SD fold, when normalized to DLL1 activation and corrected for protein expression and cell surface levels (Figure 4C–E; numerical values Figure 4—source data 2, Figure 4—source data 3, Figure 4—source data 4). In contrast, DLL4 activated N2 significantly less efficiently than did DLL1 (n = 39; mean 0.468 ± 0.161 SD fold of non-normalized luciferase activity, 0.35 ± 0.12 SD fold, when normalized to DLL1 activation and corrected for protein expression and cell surface levels (Figure 4F; numerical values in Figure 4—source data 5). To confirm that the observed differences between DLL1 and DLL4 in activating N1 and N2 were not a secondary consequence of clonal selection (however unlikely), we also analyzed additional DLL1 (n = 3) and DLL4 (n = 9) expressing ES cell clones for protein expression and N1 or N2 activation. Despite some variability of protein expression (Figure 4—figure supplement 1B and Figure 4—figure supplement 1—source data 1) and Notch activation levels between individual clones and co-cultures, all DLL4 clones consistently activated N1 significantly better than all DLL1 clones, and all DLL4 clones stimulated N2 significantly less efficiently than DLL1 (Figure 4—figure supplement 1C,D; numerical values in Figure 4—figure supplement 1—Source Data 2), indicating that both ligands differ significantly in their ability to activate different Notch receptors in our cell-based assay. Consistent with the differences in N2 stimulation by mDLL1- and mDLL4-expressing cells, the highly homologous human hD1N-E5 exhibits a higher affinity (KD = 0.36 ± 0.11 µM; Figure 1—figure supplement 2Ba) for human NOTCH2 than D4N-E5 (KD = 1.28 ± 0.2 µM; Figure 1—figure supplement 2Bb). In an attempt to identify the domains of DLL1 and DLL4 that contribute to differences in activating N1 and N2, we carried out a series of domain swaps to generate a set of chimeric ligands (II-V, VII-X in Figure 1) for stimulation of N1 and N2-expressing cells in our co-culture assay. Like wild-type ligands, chimeric ligands were expressed from single copy transgene integrations in the Hprt locus of murine ES cells. All chimeric proteins were expressed and present on the cell surface (Supplementary file 1), but expression levels varied among the chimeras (Supplementary file 2) despite integration into the Hprt locus by homologous recombination. We thus analyzed receptor selectivity of the chimeras in stimulating N1 and N2 responses using the co-culture assay by determining the N1/N2 response ratio. Stimulation with DLL1 gives a N1/N2 response ratio of approximately 1, DLL4 of ~20 (Figure 5A; numerical values used for calculations in Figure 5—source data 1, Figure 5—source data 2, Figure 5—source data 3; graphical representations of the relative luciferase activities of the ligands are shown in Figure 5—figure supplement 1). 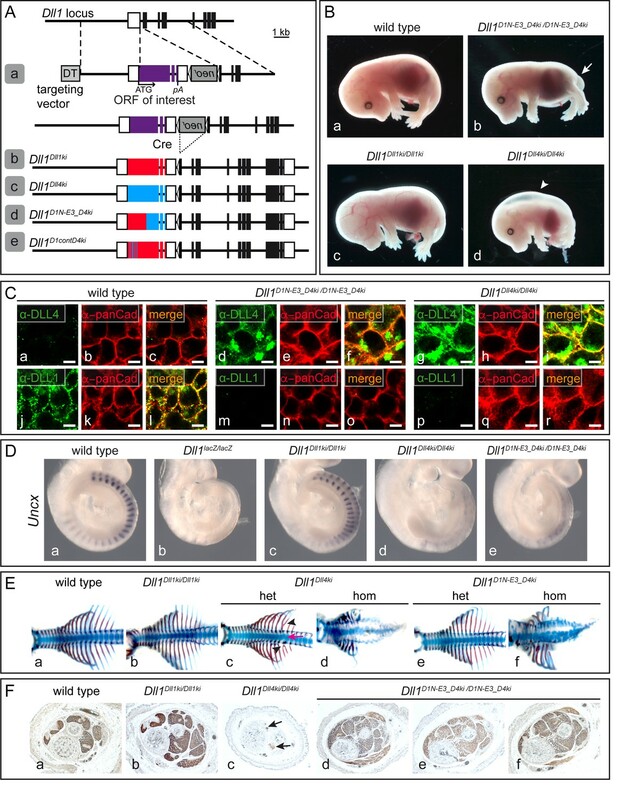 Strikingly, chimeras which retain the full ectodomain or the MNNL-EGF3 region of DLL4 have a N1/N2 stimulation ratio of approximately 20 similar to DLL4, whereas chimeras that retain the ectodomain, or MNNL-EGF3 region of DLL1 have a stimulation ratio of between one and two, resembling DLL1 (Figure 5A). These results indicate that the differences in activation potential of DLL4 and DLL1 toward N1 and N2 are encoded in the N-terminal part of the protein, encompassed by MNNL-EGF3. When chimeras include the MNNL-EGF2 or MNNL-DSL region of one ligand and the remainder of the other, the N1/N2 stimulation ratios of the chimeric pairs are equivalent (Figure 5A), indicating that the third EGF-like repeat makes an important contribution to receptor selectivity. Contributions of the MNNL-EGF3 portion and contact amino acids to ligand selectivity towards N1 and N2. (A) N1/N2 activation ratios by DLL1 and DLL4 chimeric proteins show that receptor selectivity of DLL1 and DLL4 is encoded by the extracellular domain and that EGF3 contributes to N1/N2 selectivity. DLL4, D4ECD_D1ICD, and D4N-E3_D1 show N1/N2 induction ratios of ~20. DLL1, D1ECD_D4ICD, and D1N-E3_D4 exhibit induction ratios of 1–3. Chimeric pairs with domain exchanges between EGF2 and EGF3 or between DSL domain and EGF1 show equivalent stimulation ratios. Each dot represents the mean of N1 (relative luciferase units; Figure 5—source data 1)/N2 (relative luciferase units; Figure 5—source data 2) of n ≥ 3 measurements per clone of a given ligand construct. Bars represent the Mean ± SD of n ≥ 3 clones per construct (Figure 5—source data 3). (B) Structure-based superposition of DLL1 and DLL4 (PDB ID codes 4XBM and 4XLW, respectively; (Kershaw et al., 2015; Luca et al., 2015). Top panel: NOTCH1 is rendered as a molecular surface (wheat), and DLL4 is rendered in ribbon representation (cyan). 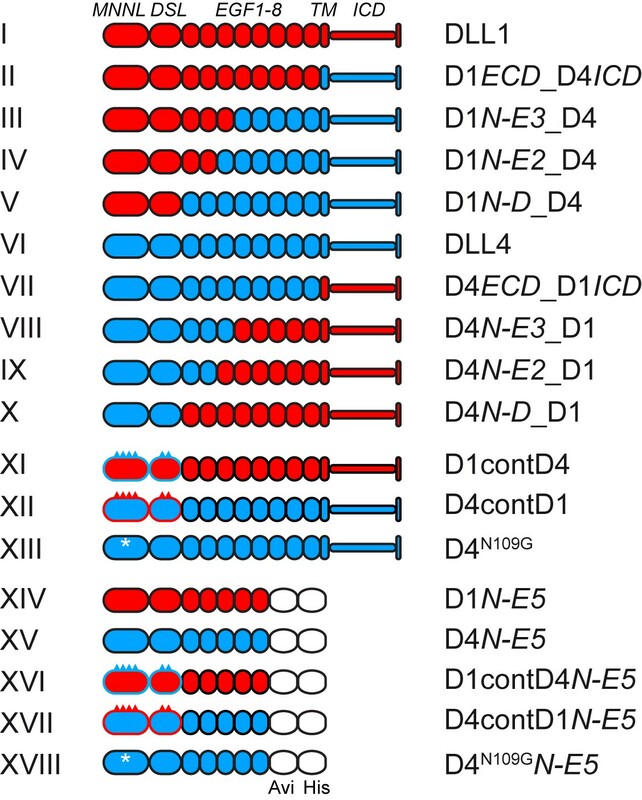 N1 contact residues on DLL4 were rendered as sticks, and were used to predict N1 contact amino acids of the MNNL and DSL domains of DLL1 (red). Domains are labeled above and below the structures, respectively, and individual domains are identified by different degrees of color shading/intensity. (C) Parts of the MNNL and DSL sequences showing the contact amino acids (boxed), the divergent amino acids of DLL1 (red) and DLL4 (blue), and the sequence of ligands with amino acid exchanges (complete sequences of the changed MNNL and DSL domains are shown in Figure 1—figure supplement 1B). The N-glycosylation site at residue N109 of DLL4 is indicated in green. (D) N1/N2 activation ratios of ligands with exchanged N1 contact amino acids. D1contD4 does not show changes in receptor selectivity compared to DLL1. Replacing the contact residues of DLL4 with those of DLL1 only reduces N1/N2 activation ratio to ~13. Elimination of the N-glycosylation site of DLL4 with the N109G mutation (the corresponding amino acid of DLL1) does not change DLL4 receptor selectivity. Each dot represents the mean of N1 (relative luciferase units; Figure 5—source data 1)/N2 (relative luciferase units; Figure 5—source data 2) of n ≥ 3 measurements per clone of a given ligand construct. Bars represent the Mean ± SD of n ≥ 3 clones per construct (Figure 5—source data 3). To analyze to what extent the amino acids that contact N1 in the binding interfaces of the MNNL and DSL domains might contribute to the different activity of DLL1 and DLL4 toward N1 and N2 we reciprocally exchanged these amino acids (XI-XII in Figure 1; Figure 5C and Figure 1—figure supplement 1B) based on alignments of the DLL4 (Luca et al., 2015) and DLL1 (Kershaw et al., 2015) structures (Figure 5B). 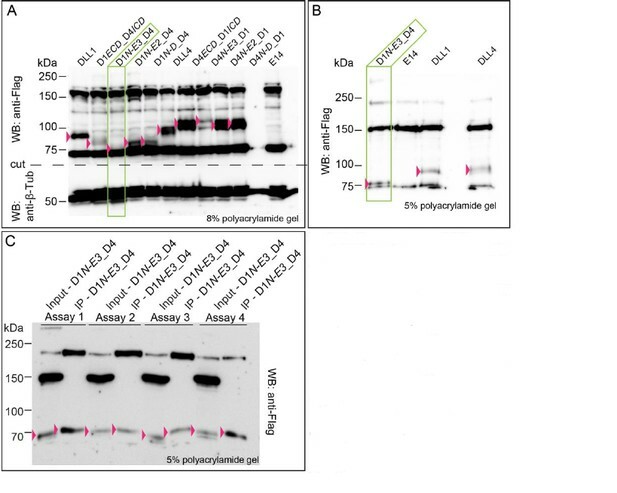 Western blot analyses of cell lysates and cell surface biotinylation and immunoprecipitation showed that all variants were present on the cell surface (Supplementary File 1). The N1/N2 response ratios show that swapping the contact residues of DLL4 onto DLL1 do not substantially affect the activation ratio when compared to DLL1 itself, indicating that the differences between DLL1 and DLL4 in N1/N2 selectivity cannot simply be accounted for by interfacial residues in the MNNL-DSL region (Figure 5D; numerical values used for calculations are in Figure 5—source data 1, Figure 5—source data 2, Figure 5—source data 3). Similarly, replacement of the DLL4 contact residues by the analogous residues of DLL1 slightly reduces the mean N1/N2 activation ratio (to ~13), but does not collapse the ratio to 1 (Figure 5D), again strongly suggesting that residues outside of the MNNL-DSL contact interface contribute to the relative N1 selectivity of DLL4. These results are consistent with 1) the domain swap data, which argue that discrimination between DLL1 and DLL4 depends on the EGF repeats as well as on the MNNL-DSL region, and 2) the prior observation that variants of DLL4 selected for high N1 affinity accumulate mutations in the protein core, but not in the binding interface (Luca et al., 2015). Swapping the contact residues of DLL1 onto DLL4 did not reduce the binding affinity of DLL4 for N1 (D4contD1 KD = 0.327 ± 0.036 µM; Figure 1—figure supplement 2Ac), fully consistent with the interpretation that the protein core of DLL4 contributes to N1 binding affinity, likely by influencing the fraction of molecules in a binding-active conformation. Although swapping the contact residues of DLL4 onto DLL1 increased binding affinity for N1 (D1contD4 KD = 0.326 ± 0.044 µM; Figure 1—figure supplement 2Ad), the substitution did not substantially change the N1/N2 activation ratio, indicating that binding affinity for N1 is not the only influence on the selectivity of the two ligands for N1 or N2. The DLL4 MNNL domain contains three N-glycosylation sites, one of which (N109) is conserved from amphibian to mammalian DLL4 ligands but absent in DLL1. This residue resides adjacent to the contact amino acid F110 (Figure 1—figure supplement 3A). We confirmed that DLL4 can actually be N-glycosylated at this site (Figure 1—figure supplement 3C) and tested whether N109-glycosylation contributes to DLL4 activity and selectivity by mutating N109 to G (XIII in Figure 1), which is the amino acid present in DLL1 in the equivalent position (G112). D4N109G had no effect on the relative activation potential of DLL4 for N1 versus N2 (Figure 5D), and its affinity for N1 was not altered (KD = 0.341 ± 0.015 µM; Figure 1—figure supplement 2Ae), indicating that N-glycosylation at this site does not significantly modulate N1 binding or contribute to the relative selectivity of DLL4 towards N1 and N2. To test whether the contact amino acids of DLL1 and DLL4 contribute to their functional divergence in vivo we generated a mouse line expressing D1contD4 (XI in Figure 1) instead of wild type DLL1 using our "mini-gene" knock-in strategy (Figure 3A). Heterozygous mice carrying this allele (Dll1D1contD4ki) are indistinguishable from wild type. Homozygous mutants obtained from heterozygous matings at the expected Mendelian ratio (6/27) were viable and fertile, and indistinguishable from wild type and Dll1Dll1ki/Dll1ki controls (Figure 6A). Uncx was expressed in regular pattern in the caudal halves of the somites of homozygous embryos (Figure 6Cd,d’), consistent with only subtle abnormalities of individual vertebral bodies in the lower thoracic region of Dll1D1contD4ki/D1contD4ki fetuses (Figure 6D; n = 3/4) indicating that the contact amino acids and different binding affinities are not a major discriminating feature of the two ligands in vivo. DLL1 carrying the DLL4 contact amino acids in the MNNL and DSL domains is a functional DLL1 ligand in vivo. (A) E15.5 Dll1D1contD4ki/D1contD4ki (c; n = 12) fetuses are indistinguishable from wild type (a; n = 19) and Dll1Dll1ki/Dll1ki (b; n = 3) controls. (B) D1contD4 co-localizes with pan-Cadherin (panCad) at the cell surface of Dll1D1contD4ki/D1contD4ki PSM cells (e-h; n ≥ 3); Scale bars: a, e = 500 µm; b-d, f-h = 5 µm. (C) Whole mount in situ hybridization showing that D1contD4 induces normal Uncx expression during somitogenesis (d,d’; n ≥ 5). (D) Skeletal preparations of Dll1D1contD4ki/D1contD4ki E15.5 fetuses showing minor defects of single vertebrae in the lower thoracic region (c,c’; n = 3/4). DLL1 and DLL4 have context-dependent redundant and divergent functions, but the bases for these differences are unclear. Here, using systematic domain exchanges and mutation of contact amino acids in the MNNL and DSL domains of DLL1 and DLL4, cell-based and biochemical assays, and transgenic mice we show that (1) DLL1 and DLL4 differ significantly in their potential to activate N1 and N2 and this difference is encoded in the ligand ectodomains, (2) regions outside the known contact interface contribute to context-dependent ligand function, and (3) the contact amino acids are not the sole or primary determinant of this discrimination between the two receptors. 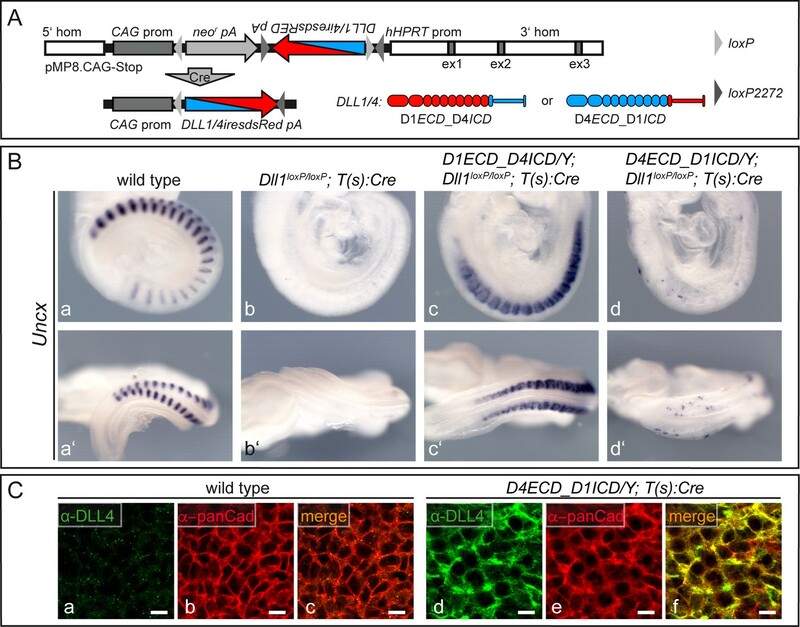 Analysis of our transgenic mice expressing D1ECD_D4ICD or D4ECD_D1ICD indicate a critical role of the ECD for the function of DLL1 during somite patterning in vivo. This resembles intrinsic functional differences that reside in the extracellular domains of mN1 and mN2 during kidney development (Liu et al., 2013), whereas the N1 and N2 ICDs appear to be functionally equivalent in various developmental contexts (Liu et al., 2015). Functional equivalence of DLL1’s and DLL4’s ICDs in vivo is further supported by the rescue of the skeletal muscle phenotype in our D1N-E3_D4 knock-in mice, which harbor the DLL4 ICD. In this developmental context even domains C-terminal to EGF3 of DLL1 appear to be interchangeable. Analyses of the ECD/ICD domain swaps in the cell-based assay also suggest that the discriminatory potential of the ligands tracks with the ECD, and not with the ICD, even though the ICD appears to affect the strength and/or dynamics of the signal in co-culture assays where ligand and receptor expression is enforced in vitro (Nandagopal et al., 2018). Additional sources of complexity in vivo, like the stronger cis-inhibitory potential of the DLL4 ECD on Notch signaling (Preuße et al., 2015), or cyclic modulation of Notch by LFNG in the paraxial mesoderm, or different interactions with lipids (Suckling et al., 2017) might account for the resistance to loss of function phenotypes from ligand ICD swaps in vivo. EGF-like repeats 11 and 12 of mouse N1 and N2 are highly similar (56/83 residues identical, 14 similar amino acids), and 13 of the 17 amino acid residues at the DLL4-binding interface are identical. Moreover, the x-ray structures of the EGF11-13 fragments of human N1 and N2 adopt a very similar arrangement (Suckling et al., 2017). Nevertheless, DLL1 and DLL4 exhibit a "discrimination potential" of ~20 fold in terms of receptor response in culture assays, suggesting that either the few different contact amino acids in EGF 11 and 12 of N1 and N2 have a significant impact or interactions of DLL1 and DLL4 with N1 and N2 are not limited to the MNNL and DSL interfaces with receptor EGF repeats 11 and 12. Domain swaps carried out here show that the region responsible for this receptor discrimination maps to the MNNL-EGF3 region (Figure 5). These findings are consistent with previous work uncovering the requirement of EGF repeats 1–3 of the DLL ligands for NOTCH1 activation, the importance of this region in the binding of Serrate family ligands to Notch receptors and in Serrate/Jagged-induced signaling, and the importance of EGF repeats 8–10 of NOTCH1 for signal activation by DLL ligands (Shimizu et al., 1999; Cordle et al., 2008; Yamamoto et al., 2012; Andrawes et al., 2013; Schuster-Gossler et al., 2016; Luca et al., 2017; Liu et al., 2017). Together, this body of work suggests that interactions of the N-terminal EGF repeats of the DLL ligands with EGF repeats 8–10 of Notch also contribute to recognition and impart discriminatory potential. The D1N-E3_D4 knock-in mice also point a functional role for domains outside the known binding interface, since this chimeric ligand does not substitute fully for DLL1 in vivo during somite patterning despite harboring the MNNL and DSL domains and EGF1-3 of DLL1, supporting context-dependent contributions of additional C-terminal EGF repeats observed previously in mice (Schuster-Gossler et al., 2016). Remarkably, the exchange of the contact amino acids in DLL1 with those of DLL4 in the D1contD4 protein does not alter receptor selectivity in cultured cells even though these changes increase N1 binding affinity. This result suggests that receptor selectivity of DLL1 and DLL4 is not determined exclusively by the differences in binding strength. The D1contD4 chimera even substitutes almost completely for DLL1 function in mice during somite patterning, which is highly sensitive to altered Notch signaling (Schuster-Gossler et al., 2009) and therefore a suitable in vivo read out to detect even minor differences of Notch ligand function. Together, our results also favor the conclusion that the contact amino acids in the MNNL and DSL domains do not make the dominant contributions to the functional divergence of DLL1 and DLL4 in vivo, suggesting instead that differences in the domain cores, and/or contacts outside of the known DLL4-NOTCH1 interface, are the factors that most contribute to this functional divergence. mouse Alexa 555 Invitrogen Cat. Antibody Mouse anti-β-Tubulin Sigma-Aldrich Cat. Antibody Anti-mouse HRP Amersham Cat. All animal experiments were performed according to the German rules and regulations (Tierschutzgesetz) and approved by the ethics committee of Lower Saxony for care and use of laboratory animals LAVES (Niedersächsisches Landesamt für Verbraucherschutz und Lebensmittelsicherheit; refs. : 33.12-42505-04-13/1314 and 33.14-42505-04-13/1293). Mice were housed in the central animal facility of Hannover Medical School (ZTL) and were maintained as approved by the responsible Veterinary Officer of the City of Hannover. Animal welfare was supervised and approved by the Institutional Animal Welfare Officer (Tierschutzbeauftragter). Wild type mice were CD1 and 129Sv/CD1 hybrids; Dll1lacZ (Hrabĕ de Angelis et al., 1997), Dll1loxP (Hozumi et al., 2004), T(s):Cre (Feller et al., 2008) and ZP3:Cre (de Vries et al., 2000), Dll1Dll1ki (Schuster-Gossler et al., 2016), and Dll1Dll4ki (Preuße et al., 2015) were described previously. Mice allowing for inducible expression of chimeric ligands were generated by morula injection of E14TG2a ES cells carrying the expression construct in the Hprt locus. E14TG2a cells were electroporated with linearized targeting constructs and correct integrations were identified by HAT selection and validated by long-range PCR using primers: For/Rev: GGGAACCTGTTAGAAAAAAAGAAACTATGAAGAAC/GGCTATGAACTAATGACCCCG. Dll1D1N-E3_D4ki and Dll1D1contD4ki mice were generated with 129Sv/cast ES cells. ES cells were electroporated with linearized targeting constructs, Cas9 D10A nickase (Addgene #42335; Cong et al., 2013) expression vector and guide RNAs targeting the first intron of Dll1 to increase the frequency of homologous recombination (guideA-FOR: GGCAGCGGGCAGCTCCGGAT; guideB-REV: GCTCTCGGGGTCGTCGCTGC, according to http://crispr.mit.edu/ the pair score for A and B – 79, 0 off target pairs, and 0 genic OT pairs). G418 resistant clones were screened for targeted integrations by long-range PCR using primers: For/Rev TGTCACGTCCTGCACGACG/GGTATCGGATGCACTCATCGC and correct targeting events verified by Southern blot analysis (5’ probe: a 316 bp BamHI/AvaII fragment 3.8 kb upstream of Dll1 exon 1; 3’ probe: a 528 bp PCR fragment in Dll1 intron five obtained with primers CCTGTGAGACTTTCTACGTTGCTC/CACAACCATGTCACCTTCTAGATTC). The neor cassette was excised in the female germ line using ZP3:Cre mice. cDNAs encoding Flag-tagged ligand proteins with exchanges of domains or individual amino acids in the extracellular domain of DLL1 and DLL4 were generated by standard cloning procedures using either synthesized gene fragments (II-IV, VII-IX, XI-XIII in Figure 1) or fragments obtained by restriction digests from Dll1 and Dll4 cDNA constructs (V, X in Figure 1). Tagged cDNAs were cloned into pMP8-CAG.Stop-shuttle as EcoRI/BamHI or EcoRI/NotI fragments. The stop cassette was excised by Cre mediated recombination of the loxP sites in bacterial SW106 cells. D1ECD_D4ICD and D4ECD_D1ICD were generated by PCR amplification of the respective untagged cDNAs and subcloned into shuttle vector pSL1180dttomato containing the wild type and mutant loxP sites and iresdsRED. Subsequently, the fragments encoding the chimeric ligands fused to iresdsRED were cloned into pMP8-CAG.Stop (Preuße et al., 2015) using MluI and Swa1 restriction sites. Dll1D1N-E3_D4ki and Dll1D1contD4ki targeting constructs were generated by standard cloning procedures based on the Dll1Dll1ki (Dll1tm7.1Gos) or Dll1Dll4ki (Dll1tm4.1Gos) targeting vectors (Preuße et al., 2015; Schuster-Gossler et al., 2016). First, the 3’ DT cassette was removed by PmeI and AatII digest and relegation of the blunt ended plasmid. EcoRI fragments containing the Dll1 or Dll4 coding sequences in the targeting vector lacking the 3’ DT cassette were excised by EcoRI and cloned into pCR-TOPO-XL. The wild type Dll1 sequence was replaced in pCR-TOPO-XL by a D1contD4 cDNA, the Dll4 sequence by D1N-E3_D4 cDNA. Fragments were ligated back into the targeting vectors as EcoRI fragments. For production and purification of proteins for binding assays (XIV-XVIII in Figure 1) fragments encompassing the N-terminus up to and including EGF5 were PCR amplified and cloned into pLexM-Avi-His vector (Andrawes et al., 2013) as EcoRI/BamHI fragments by standard procedures. E9.5 embryos were collected in ice cold PBS and fixed in 4% formaldehyde/PBS over night at 4°C and dehydrated in methanol. In situ hybridization was performed according to standard procedures with digoxigenin labelled cDNA probes for Uncx (Neidhardt et al., 1997). E18.5 embryos were collected in ice cold PBS, fixed in 4% formaldehyde/PBS over night at 4°C, dehydrated in methanol, ethanol, and 2-propanol. Hind limbs were paraffin embedded and 10 µm transverse sections stained for Myosin Heavy Chain (MHC). E9.5 embryos were collected in ice cold PBS, fixed in 4% formaldehyde in PBS and immunofluorescence staining was performed as described in Bone et al. (2014). Used primary antibodies: anti-DLL1 (1F9; 1:50) (Geffers et al., 2007), anti-DLL4 (AF1389, R and D; 1:50), and anti-pan-Cadherin (C1821, Sigma; 1:250). Used secondary antibodies: Alexa488/555 conjugated antibodies (Invitrogen; 1:100). Images were taken using OLYMPUS FV1000. E15.5 fetuses were collected in ice cold PBS and dehydrated in EtOH. Alcian blue and Alizarin red staining was performed using standard procedures (Cordes et al., 2004). Cells were lysed in 2x sample buffer (0.125M Tris pH 6.8; 4% SDS; 20% glycin; 5% β-mercaptoethanol; 0.025% bromphenol blue). Proteins were separated by SDS-PAGE and transferred onto Immobilon-P Transfer membranes (Millipore) by wet tank or SemiDry blotting. Membranes were blocked in 5% nonfat dried milk powder (AppliChem) in PBS/0.1% Tween20 and subsequently incubated in 5% nonfat dried milk powder containing primary antibodies. Used primary antibodies: anti-Flag HRP (mouse monoclonal; clone M2; Sigma; 1:10 000), anti-b-Tubulin I (Sigma; 1:500 000/1:1 000 000). Used secondary antibodies: anti-mouse HRP (Amersham; 1:10 000). For HRP detection ECL Western Blotting Detection Reagent (Amersham) and WesternBright Quantum (advansta) were used with Luminiscent Image Analyser LAS4000 (Fujifilm). ImageJ was used to quantify signals. HeLaN1 cells were lysed in Tri-Reagent (Sigma) and RNA was isolated according to the manufacturer’s instructions. Reverse transcription was performed using SuperScript IV (Invitrogen) according to the manufacturer’s instructions. Primers used for RT-PCR analysis were: mNotch1 For/Rev TAGGTGCTCTTGCGTCACTTGG/TCTCCCCACTCGTTCTGATTGTC; hNOTCH1 For/Rev TCCACCAGTTTGAATGGTCA/AGCTCATCATCTGGGACAGG (Ding et al., 2012); hNOTCH2 For/Rev CAACCGCCAGTGTGTTCAAG/GAGCCATGCTTACGCTTTCG; hNOTCH3 For/Rev AGATTCTCATCCGAAACCGCTCTA/GGGGTCTCCTCCTTGCTATCCTG (Büchler et al., 2005); hGAPDH For/Rev GAGTCAACGGATTTGGTCGT/TTGATTTTGGAGGGATCTCG (Ding et al., 2012). Genomic DNA was isolated from ES cells, digested with BamHI overnight and separated on an 0.7% agarose gel. Blotting, crosslinking, hybridization, and signal detection were performed using Immobilon-Ny+ membrane (Millipore) according to the manufacturer’s instructions. Mouse E14TG2a and 129Sv/cast ES cells were cultured in DMEM (Invitrogen) cell culture medium supplemented with 15% FCS (Biochrom AG), Glutamax, Pen/Strep, Sodium Pyruvate, MEM Non-Essential Amino Acid Solution, β-mercaptoethanol, and leukemia inhibitory factor (LIF), HeLaN1 cells were cultured in DMEM (Invitrogen) cell culture medium supplemented with 10% FCS (Biochrom AG), Glutamax and Pen/Strep. All cell lines were tested negative for mycoplasma. No authentication of cell lines was performed. ES cells were electroporated with linearized pMP8 targeting vectors and selected with HAT (1:300; Gibco). Correct integration of the 5’ homology arm in HAT resistant clones was verified with long-range PCR using following primers: For/Rev: GGGAACCTGTTAGAAAAAAAGAAACTATGAAGAAC/GGCTATGAACTAATGACCCCG. Expression of proteins was verified using Western Blot analyses. For in vitro cell co-culture assays ES cells were counted in PBS using LUNA-II (logos biosystems) and 9.25 × 105 ligand and 0.75 × 105 receptor expressing cells were plated on gelatin coated six well plate dishes. After 24 hr fresh medium was added. 48–52 hr after co-cultivation cells were washed once with PBS, lysed in 250 µl 1xCCLR (Luciferase Cell Culture Lysis Reagent, Promega), transferred into 1.5 ml tubes, and frozen at −80°C. For measurements lysates were thawed, vortexed, and briefly centrifuged. 20 µl aliquots of each lysate was measured with Luciferase Assay Reagent in duplicates or quadruplicates using GloMax-96 (Promega). For determination of relative cell surface protein levels, cells were treated with Sulfo-NHS-LC-Biotin (Pierce; 0.25 mg/ml PBS supplemented with 1 mM MgCl2 and 0.1 mM CaCl2), quenched with 100 mM glycine in DMEM and lysed in lysis buffer supplemented with Complete Proteinase Inhibitor Cocktail Tablets (Roche). Biotinylated proteins were immunoprecipitated using NeutrAvidin beads (Thermo Scientific) and analyzed by Western blotting. For detailed information see (Braune et al., 2014; Preuße et al., 2015). The cDNA for expression of the N1 fragment using the pLexM vector was described previously (Andrawes et al., 2013) and encodes the N1 signal sequence followed by EGF repeats 6–15 (amino acids 216–604), a biotinylation (avi) tag, and a His6 tag. The cDNAs for expression of DLL1, DLL4, and all chimeric proteins extend from the N-terminus through EGF5. These proteins were also subcloned into pLexM as described (Andrawes et al., 2013). The N2(1–15)-Fc protein was purchased from R and D systems and used without further purification. Expi293F cells maintained in Expi293 expression media were grown to cell density of 106 cells/ml and then transiently transfected with Dll1 ligand, Dll4 ligand or N1 DNA (1 mg/liter of cells) and FectoPro transfection reagent (Polyplus) at 1:1 DNA/FectoPro ratio. For biotinylation of Avi-tagged NOTCH1 protein, cells were co-transfected with biotin ligase (BirA) DNA as well as with DNA encoding Protein O-fucosyltransferase-1 (POFUT1), which enhances Notch folding and secretion. Transfected cells were then cultured in FreeStyle293 media for 3–4 days to produce protein. The media was collected, separated from the cells by centrifugation and supplemented with 50 mM Tris buffer, pH 8.0. The resulting supernatant was bound to Ni-NTA beads (Qiagen) over a 3 hr incubation at 4° C. After a wash with ten column volumes of 50 mM Tris buffer, pH 8.0, containing 150 mM NaCl, 5 mM CaCl2, and 20 mM Imidazole, bound protein was eluted with the same buffer supplemented with 250 mM Imidazole. Following elution, fractions containing the partially purified proteins were concentrated and further purified by gel-filtration chromatography using a Superdex 200 column in 50 mM Tris, pH 8.0, containing 150 mM NaCl, and 5 mM CaCl2. The quality of the resulting purified proteins was assessed using non-reducing SDS-PAGE. Pure fractions were pooled, flash frozen and stored at −80° C. The efficiency of biotinylation was estimated by immunoprecipitation with streptavidin resin. Ligand binding affinities were quantified by biolayer interferometry using a BLItz instrument (ForteBio). For N1 binding, streptavidin biosensors were loaded with the biotinylated Notch1 fragment, equilibrated in buffer for 30 s, then dipped into ligand samples of varying concentration until equilibrium was observed. For N2 binding, protein A biosensors were used for the capture step. All ligand-receptor binding experiments were done in HBS-P buffer containing 0.005% surfactant P20, supplemented with 5 mM CaCl2. Equilibrium binding curves were fitted with a one site - specific binding model using GraphPad Prism. Statistical analyses were done using Prism7 (GraphPad) as indicated in Figure legends. The Journal of Experimental Medicine 204:331–343. Molecular and Cellular Biology 34:1221–1233. Nature Reviews Molecular Cell Biology 17:722–735. Nature Structural & Molecular Biology 15:849–857. The Journal of Cell Biology 178:465–476. Annual Review of Cell and Developmental Biology 27:539–562. Journal of Cellular Biochemistry 118:785–796. Seminars in Cell & Developmental Biology 23:473–480. The Journal of Immunology 185:867–876. Journal of Biological Chemistry 278:21232–21239. Development Genes and Evolution 207:330–339. The Journal of Biological Chemistry 274:32961–32969. Thank you for submitting your article "The ectodomains determine ligand function in vivo and selectivity of DLL1 and DLL4 toward NOTCH1 and NOTCH2 in vitro" for consideration by eLife. Your article has been reviewed by three peer reviewers, and the evaluation has been overseen by Urban Lendahl as Reviewing Editor and Didier Stainier as Senior Editor. The following individuals involved in review of your submission have agreed to reveal their identity: Thomas Gridley (Reviewer #1); Rhett A Kovall (Reviewer #2); Cecilia Sahlgren (Reviewer #3). The manuscript addresses the important question of ligand-receptor specificity in the Notch signaling pathway. The authors describe structure-function analyses, and functional divergence, of the Notch ligands DLL1 and DLL4, using in vivo as well as in vitro techniques. The authors conclude that the DLL1 and DLL4 proteins activate the Notch1 and Notch2 receptors differently. DLL4 consistently activated NOTCH1 significantly better than DLL1, and DLL4 stimulated Notch2 significantly less efficiently than DLL1.To identify the domains of DLL1 and DLL4 that contributed to the observed differences in activating Notch1 and Notch2, domain swaps to generate a set of chimeric DLL1/DLL4 ligands was performed. These experiments revealed that the differences in activation potential of DLL4 and DLL1 toward Notch1 and Notch2 are encoded in the N-terminal part of the protein, comprising the MNNL-EGF3 domains, but also with a contribution from the third EGF repeat. This is interesting, as these regions lie outside the established receptor-ligand interaction domains. 1) In the Abstract the authors state, "Collectively, our data show that DLL4 and DLL1 preferentially activate NOTCH1 and NOTCH2, respectively,"; however, the N1/N2 ratio data in Figure 5A suggest that DLL1 has no preference for Notch1 over Notch2. Please clarify. 2) In the last paragraph of the subsection “Regions outside the known receptor binding domain are essential for full DLL1 function in vivo”, the authors use the word "undistinguishable", do the authors mean indistinguishable? 3) Regarding the in vivo data where different chimeras are used to substitute for DLL1 there appears to be additional staining or even puncta for the ligand, e.g. Figure 2Cd, Figure 3Cdfgi, Figure 6Bfh, that is not at the cell surface and is not seen in the wild-type tissues. Could the authors provide some explanation as to what this additional staining is and do they think that this accumulated ligand has any effect on the phenotypes that they are seeing? 4) In Figure 3Fc do the authors mean Dll1Dll4ki/Dll4ki rather than Dll1Dll1ki/Dll1ki as currently stated? 5) In Figure 5B, I would suggest that the authors label the domains of Notch1, Dll4, and Dll1 on the structures to clarify these regions for the reader who is not a structural biologist. 6) Figure 4E and F. Showing both black dots and triangles in the same graph is confusing. 7) Figure 5 and subsection “The region encompassing the MNNL up to and including EGF3 encodes the differential receptor selectivity of DLL1 and DLL4” MNNL-DSL (D1N-D_D4 & D4N-D_D1) values don't look intermediate but as low (if not lower) than D1N-E3_D4 – rephrase? 8) Discussion, second paragraph – D1ECD_D4ECD changed to D1ECD_D4ICD. 9) Much of the data (protein-protein levels, membrane levels and signalling activity) from the co-culture signalling studies are adjusted to a data point set to 1 and many of the analyses are further related to this reference value which is an average. There is high variability and the original data was not shown and the number of analyses were very high. I would like to see the original data, ask for a comparison between membrane levels, total protein levels and signal activity within a set of experiments to avoid making erroneous conclusions based on statistical "engineering"
10) Figure 4C, E and F Why only n=1 in Dll1? Does that represent the average? What is the variability? 11) Figure 5. Showing the N1 and N2 stimulations and not only the ratio could add some clarity (Despite varying membrane levels). Perhaps a supplementary figure? 12) Figure 5. How come D1N-E3 gives such a strong signal in reporter assays if it is not detectable/quantifiable on WB or biotinylation assay? Could you provide the image of the WB for assurance? 13) The chimeric ligand is expressed more efficiently than the endogenous one (Figure 3C). Could this affect the result? The full reviews are also included for your reference, as they contain detailed and useful suggestions. The authors describe structure-function analyses, and functional divergence, of the Notch ligands DLL1 and DLL4, using cell co-culture assays, biochemical assays, and in vivo analyses of genetically modified mice expressing recombinant DLL1/DLL4 chimeric proteins. The authors demonstrate that, in cell based co-culture assays, the DLL1 and DLL4 proteins activate the NOTCH1 and NOTCH2 receptors differently. They generated mouse NOTCH1 and NOTCH2 reporter ES cell lines by integrating a Notch luciferase reporter in the Hprt locus of mouse E14TG2a ES (E14) cells, thus generating stable mN1 (N1rep) or mN2 (N2rep) reporter lines. These reporter lines were then co-cultured with ES cells with single copy integrations into the Hprt locus of the DLL1 or DLL4 coding sequences. Performing careful controls for total protein and cell surface protein expression levels, they showed that all DLL4 clones consistently activated N1 significantly better than all DLL1 clones, and all DLL4 clones stimulated mN2 significantly less efficiently than DLL1. To identify the domains of DLL1 and DLL4 that contributed to the observed differences in activating NOTCH1 and NOTCH2, they performed a series of domain swaps to generate a set of chimeric DLL1/DLL4 ligands. These experiments revealed that the differences in activation potential of DLL4 and DLL1 toward N1 and N2 are encoded in the N-terminal part of the protein, comprising the MNNL-EGF3 domains. Additional experiments showed that the third EGF repeat made an important contribution to receptor selectivity. The authors then analyzed the importance of the amino acids that contact N1 in the binding interfaces of the MNNL and DSL domains in NOTCH receptor selectivity. In a series of biochemical experiments, the authors showed that swapping the contact residues of DLL4 onto DLL1 did not substantially affect Notch receptor activation compared to wildtype DLL1. Replacement of the DLL4 contact residues by the analogous residues of DLL1 slightly affected Notch receptor activation, but did not approach the activity difference of wildtype DLL1. For in vivo analyses, the authors utilized a sophisticated genetic model system in which transgenes encoding chimeric DLL1/DLL4 ligands were introduced into the Hprt locus of E14 ES cells in a manner that requires Cre recombinase expression to permit expression of the chimeric ligand. Simultaneously, endogenous wildtype DLL1 expression was removed using a floxed Dll1 allele and a Cre driver (T(s):Cre) expressed in the primitive streak driven by a promoter derived from brachyury (T) locus. These experiments demonstrated that the extracellular domains of the DLL1 and DLL4 ligands regulated ligand function during somite formation. The authors then tested a chimeric ligand that contained the N-terminal region up to and including EGF3 of DLL1 fused to EGF4 and the remaining C-terminal portion of DLL4. Mice homozygous for this allele (and lacking the wildtype Dll1 allele) were still born and exhibited substantial axial skeletal defects, indicating that this chimeric allele cannot fully replace wildtype DLL1 function during development. These experiments, as is characteristic of all the work from the Gossler and Blacklow laboratories, are carefully controlled, extremely thorough, and very convincing. This paper makes an important contribution to the literature on structure/function analysis of the Notch ligands. The authors submit an interesting and compelling manuscript that focuses on using different in vivo and cellular assays to characterize the functional differences between Dll1 and Dll4. The work is of high quality and the manuscript is well written. Moreover, their findings address an important area of Notch signaling and biology in general, and impact other recent publications that characterize functional differences between Dll1/4. If the authors were to address my relatively minor comments summarized below, I would recommend their manuscript to be published eLife. In the Abstract the authors state, "Collectively, our data show that DLL4 and DLL1 preferentially activate NOTCH1 and NOTCH2, respectively,"; however, the N1/N2 ratio data in Figure 5A suggest that DLL1 has no preference for Notch1 over Notch2. Please clarify. In the last paragraph of the subsection “Regions outside the known receptor binding domain are essential for full DLL1 function in vivo”, the authors use the word "undistinguishable", do the authors mean indistinguishable? Regarding the in vivo data where different chimeras are used to substitute for DLL1 there appears to be additional staining or even puncta for the ligand, e.g. Figure 2Cd, Figure 3Cdfgi, Figure 6Bfh, that is not at the cell surface and is not seen in the wild-type tissues. Could the authors provide some explanation as to what this additional staining is and do they think that this accumulated ligand has any effect on the phenotypes that they are seeing? In Figure 3Fc do the authors mean Dll1Dll4ki/Dll4ki rather than Dll1Dll1ki/Dll1ki as currently stated? In Figure 5B, I would suggest that the authors label the domains of Notch1, Dll4, and Dll1 on the structures to clarify these regions for the reader who is not a structural biologist. The work by Tveriakhina and colleagues addresses the biochemical rational behind the context dependent functional differences of Notch ligands. The in vivo evidence is strong and they nicely demonstrate context dependent contributions of Notch ligand extracellular EGF repeats in vivo. They further demonstrate, although the data raise some concerns, that Dll1 and Dll4 ligands exhibit different receptor selectivity and discriminate between Notch1 and Notch2 receptors and that this is caused by differences in ligand ECD domains outside the established receptor-ligand interaction domains (contact domains). The paper is well written, clear and concise. The data is well presented and for the most part support the conclusions. The work provides novel insight into the receptor-ligand interphase and presents protein regions that contribute to functional divergence of ligands and warrants publication, provided the authors address the concerns raised. In addition, to stay within the length limit we have slightly reworded the Abstract as indicated. We changed “undistinguishable” to “indistinguishable”. “Additional intracellular staining most likely reflects the presence of the ligand in the ER and trans Golgi as observed previously for DLL1 in cultured cells (Geffers et al., 2007; Müller et al., 2014) and for endogenous DLL1 and transgenic DLL4 in the PSM (Preusse et al., 2015)“. And the new citation (Müller et al., 2014) was added to the references. We regret this error and have corrected the mislabeling. We have labelled the structures in revised Figure 5B as suggested and indicated the domains by different shadings. We have changed Figure 4E and F (please see also point 9). This error has been corrected. We have included the ratios of DLL1/TUB and DLL4/TUB determined by Western blot quantitation in Figure 4—source data 2 and show now an additional graph (in the revised Figure 4—figure supplement 1) depicting the values obtained from multiple technical replicates of the DLL1 and DLL4 clone done in parallel. We also show in the revised Figure 4E and F the non-normalized N1 and N2 activation (RLU values minus background; previously only given in the tables in Figure 4—figure supplement 1—source data 2; now for clarity also in Figure 4—source data 4 and 5) from analyses done in parallel in addition to the normalized values. This representation shows that despite the variability between different co-cultures DLL4 consistently activates N1 better and N2 less efficiently than DLL1. In addition we have expanded Figure 4 figure supplement 1 and show graphs for the technical replicates of all DLL1 (4) and DLL4 (10) clones. Normalized values are presented in the right graphs of Figure 4E and F, and in the right graphs in Figure 4—figure supplement 1. The dot in Figure 4 C represented the “average” of 10 DLL1 measurements set to 1. Each DLL4 value was referenced to its paired DLL1 value, which was arbitrarily set to 1 for each measurement. As described for point 9 we have included now the original DLL/TUB ratios in Figure 4—source data 2 and Figure 4—figure supplement 1A. We followed this suggestion and have included new Figure 5—figure supplement 1 showing the relative luciferase activity measured in co-cultures. D1N-E3 is detectable on WB and after biotinylation, but cannot be quantified with confidence due to a closely co-migrating background band detected by the anti-Flag antibodies. We have tried different polyacrylamide concentrations but could not separate the background band enough for reliable quantification. We include representative WBs (which could be added as a supplementary file if required) as Author response image 1. Expression of D1N-E3_D4 cannot be quantified with confidence due to a closely co-migrating background band detected by the anti-Flag antibody. (A) Expression of wild type DLL1 and DLL4 and of chimeric ligand proteins. Protein migration size varies due to differential post-translational modifications of the extracellular domains of DLL1 and DLL4. Double bands in DLL4, D4ECD_D1/CD, D4N-E3_D1, D4N-E2D1, and D4N-D_D1 lysates represent most likely differential modification states of the DLL4’s ECD. (B) D1N-E3_D4 migrates right at the dye front when using a 5% polyacrylamide gel. (C) Immunoprecipitation of D1N-E3_D4 after cell surface biotinylation in four independent assays. Input samples represents the whole cell lysate, IP samples represents the immunoprecipitated proteins. D1N-E3_D4 is detected in IP samples indicating its presence at the cell surface. The expression, however, cannot be quantified with confidence as the proteins are detected right at the dye front when using a 5% polyacrylamide gel. Pink arrowheads point to the proteins of interest. Green rectangles highlight the D1N-E3_D4 chimera lysate in (A) and (B). We appreciate the reviewer’s concern about whether there are different amounts of protein in the two conditions. However, because anti-DLL1 antibodies were used to detect endogenous DLL1, and anti-DLL4 antibodies to detect the chimeric ligand (as indicated in the panels of Figure 3C), which cannot be detected using the anti-DLL1 antibodies, the protein levels cannot be compared based on differences in staining intensity because the antibodies are different. In addition, we have corrected spelling/formatting mistakes and errors, updated legends and references to figures, figure supplements and source data files, included the Key Resources Table and a statement concerning mycoplasma tests and cell line authentication in the Materials and methods section, and made other changes requested by the editorial support team (supplementary files changed to figure supplements, file type changes, adjustment of nomenclature, added information in the Materials and methods section). We thank Kristina Preusse for providing the cDNAs for D1N-E2_D4, D1N-D_D4, D4N-E2_D1, and D4N-D_D1 chimeric ligands and Patricia Delany-Heiken for excellent technical assistance. Animal experimentation: All animal experiments were performed according to the German rules and regulations (Tierschutzgesetz) and approved by the ethics committee of Lower Saxony for care and use of laboratory animals LAVES (Niedersächsisches Landesamt für Verbraucherschutz und Lebensmittelsicherheit; refs. : 33.12-42502-04-13/1314 and 33.14-42502-04-13/1293). Mice were housed in the central animal facility of Hannover Medical School (ZTL) and were maintained as approved by the responsible Veterinary Officer of the City of Hannover. Animal welfare was supervised and approved by the Institutional Animal Welfare Officer (Tierschutzbeauftragter). © 2018, Tveriakhina et al.